Kallista State School opened on 10th March, 1919 as South Sassafras State School which is what Kallista was called at that time. The school of 30 children commenced in the Mechanics Institute Hall which is opposite the current school. Mrs Maude Weavers (nee Gleghorn) tells of her time as a 13 year old student starting at the school in 1919. Subjects taught were English, History, Geography, Arithmetic. The children worked on slates to save paper. The iron roof of the school would drip onto the pupils books on frosty mornings. The teacher, Mrs Evelyn Nicholls, requested a “press” (cupboard) for the books as the mice were eating them. In 1921, the Forestry Commission of Victoria granted “permissive occupancy” of three acres (and later an extra acre) at South Sassafras which is the location of the current school. Many working bees were held to clear the land and raise money for a building. Finally, in 1924, the building of a one room school was completed and officially opened. 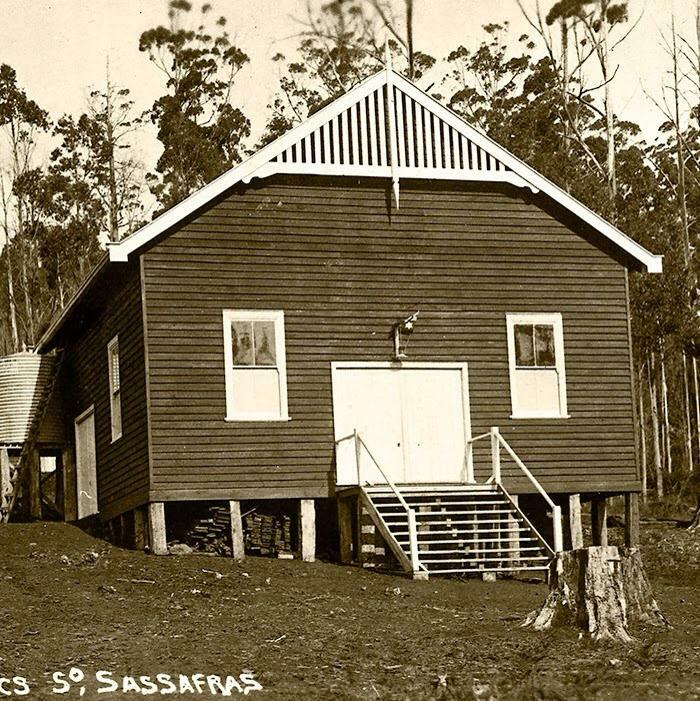 As the communities grew, the names of Sassafras, Sassafras Gully and South Sassafras caused confusion and a prize was offered to choose a suitable name for South Sassafras. Kallista was chosen. It is from the Greek, “Kallistos” meaning “most beautiful”. The school became Kallista State School on 1st April 1925. The school attendance doubled and in 1932 a school building was moved, piece by piece, from Tarrawarra (Gruyere area) to make another classroom. The land was transformed from a clearing in the forest to a well ordered school ground with gardens, a basketball court, a cricket pitch and plenty of space for future development. In 1937, Kallista State School ceased to have children beyond Grade 6 as the Upwey Higher Elementary School opened. This resulted in students leaving, but it also changed the character of the school. In the late 1940’s and 50’s, a number of Dutch settlers moved into the area and enrolled in the school resulting in increased enrolments. Additional classrooms were added in 1954, 1955 and 1966. In 1943 a School Residence was built in the school grounds for the head teacher. Mrs Wilma Everingham nee Willy Van Dyke wrote of her recollections at the school the 1950’s. “The setting was superb. In the midst of the Sherbrooke Forest we had nature’s playground. Our nature walks always took us to creeks, finding lyrebird mounds and listening to bird calls etc. The school grew rapidly in the 70’s and 80’s with relocatable classrooms being brought in. A new school at The Patch opened in 1982 relieving the pressure of overcrowding at Kallista. In 1984 the school residence was removed and the area was developed into an adventure playground. Relocatable classrooms were temporarily moved to the oval in December 1989 to allow for excavation and construction of the Fire Refuge throughout 1990. The Fire Refuge was built for a cost of $520,000 and it was the only one built in this style in Victoria. The building is constructed of solid brick and concrete with heavy shutters. It can be completely cut off in event of a fire and has its own generator, water storage system, toilets, and air unit. In 1993, Kallista township celebrated its centenary with celebrations in the town and at the school. A book about the school was published : “Kallista – A school in the Forest – 1919 to 1993.” Much of the information above has been taken from this book. In August 1999, a permaculture garden was built by parents and children at the school. A few parents with Permaculture training, guided teachers and children as vegetable plants were grown, then harvested produce was used in class cooking activities. In January 2007, Kallista Primary School was accepted into the Stephanie Alexander Kitchen Garden Program. With children in grades F-6 having regular timetabled garden sessions under instruction of a part time garden specialist, the garden has grown and flourished. Harvested produce is turned into tasty meals by the children. Read more about our Kitchen Garden program in its own section of this website.